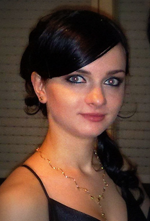 Ľudmila Kluková graduated in 2012, when she received MSc. degree in Nutrition and Health Protection at the Slovak University of Technology (Bratislava, Slovakia). Nowadays, she is working at the Institute of Chemistry, Slovak Academy of Sciences in Bratislava to obtain a PhD. degree in biotechnology. Her main task includes optimisation of lectin-based affinity biosensors and application of nanomaterials to improve biosensors´ properties. Klukova L, Bertok T, Tkac J: Glycomics as a tool for diagnosis of various diseases (in slovak), Chemicke Listy, submitted, 2013. Klukova L, Bertok T, Tkac J: Properties and electrochemical use of graphene (in slovak), Chemicke Listy, submitted, 2013.